The NASA/ESA Hubble Space Telescope has captured the sharpest and biggest image ever taken of the Andromeda galaxy — otherwise known as Messier 31. The enormous image is the biggest Hubble image ever released and shows over 100 million stars and thousands of star clusters embedded in a section of the galaxy’s pancake-shaped disc stretching across over 40 000 light-years. 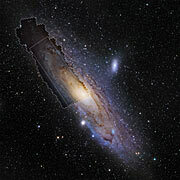 This sweeping view shows one third of our galactic neighbour, the Andromeda Galaxy, with stunning clarity. The panoramic image has a staggering 1.5 billion pixels — meaning you would need more than 600 HD television screens to display the whole image . It traces the galaxy from its central galactic bulge on the left, where stars are densely packed together, across lanes of stars and dust to the sparser outskirts of its outer disc on the right. 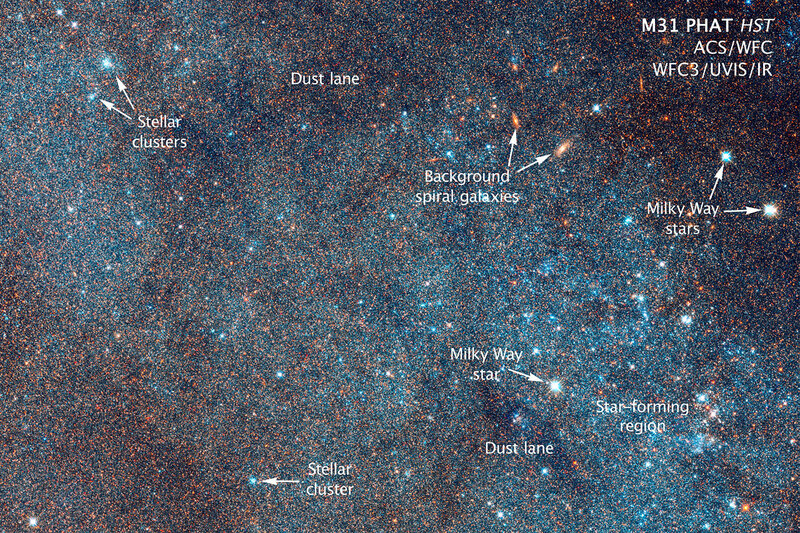 The large groups of blue stars in the galaxy indicate the locations of star clusters and star-forming regions in the spiral arms, whilst the dark silhouettes of obscured regions trace out complex dust structures. Underlying the entire galaxy is a smooth distribution of cooler red stars that trace Andromeda's evolution over billions of years. The Andromeda Galaxy is a large spiral galaxy — a galaxy type home to the majority of the stars in the Universe — and this detailed view, which captures over 100 million stars, represents a new benchmark for precision studies of this galaxy type . The clarity of these observations will help astronomers to interpret the light from the many galaxies that have a similar structure but lie much further away. 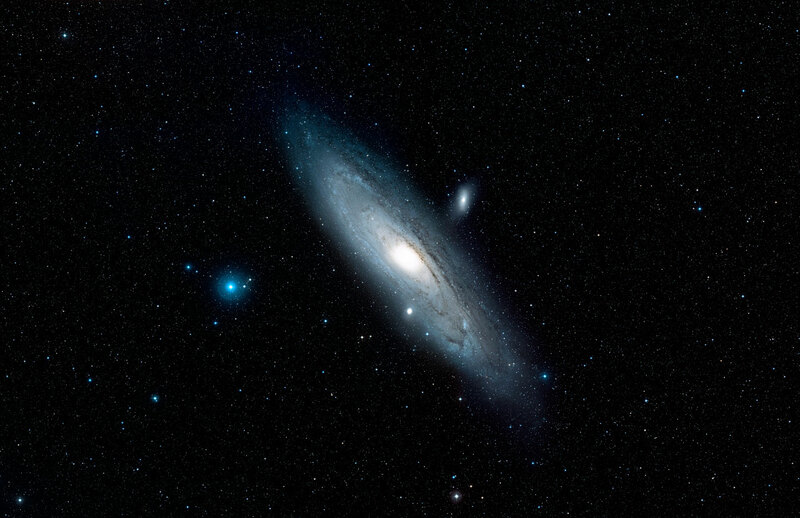 Because the Andromeda Galaxy is only 2.5 million light-years from Earth it is a much bigger target on the sky than the galaxies Hubble routinely photographs that are billions of light-years away. In fact its full diameter on the night sky is six times that of the full Moon. To capture the large portion of the galaxy seen here — over 40 000 light-years across — Hubble took 411 images which have been assembled into a mosaic image. (PHAT) programme. Images were obtained from viewing the galaxy in near-ultraviolet, visible, and near-infrared wavelengths, using the Advanced Camera for Surveys aboard Hubble. This view shows the galaxy in its natural visible-light colour as photographed in red and blue filters. The image was presented today at the 225th meeting of the American Astronomical Society in Seattle, Washington, USA. The image featured here has 69 536 x 22 230 pixels and is a cropped version of the full uncropped image which has 3.9 billion pixels and covers a length of almost 60 000 light years. The whole galaxy contains over one thousand billion stars. Image credit: NASA, ESA, J. Dalcanton (University of Washington, USA), B. F. Williams (University of Washington, USA), L. C. Johnson (University of Washington, USA), the PHAT team, and R. Gendler.